The Idaho Statesman has an editorial this morning arguing that it is “premature and irresponsible” to comment about the 10 Baptist detainees in Haiti. The editorial uses a common rhetorical device of presenting the reader with black and white choices. No middle ground here. Were the Americans well-intentioned – albeit woefully naive about international law? Or were they engaged in a criminal act in a nation where leaders believe they must, in the aftermath of catastrophe, take an unflinching stand against the abhorrent act of human trafficking? Actually, the legal question is the least interesting aspect of this sorry story. When did ignorance of the law become a defense? Of course, they broke the law. They attempted to take 33 children across the border to the Dominican Republic without the proper papers. The fact that they might be “well-intentioned” is beside the point if you only look at this (as the Statesman claims we must) as a legal issue. I see this as a story about poverty and about hubris. The real tragedy is that many of the 33 “orphans” had been taken from Haitian parents. Representatives of Laura Silsby’s New Life Children Refuge approached parents from Callebasse, a village outside the direct path of the earthquake but extremely poor, and asked them to give up their children. The parents were promised that their children would be provided with food, shelter and schooling. What were the intentions of Laura Silsby and her New Life Children Refuge? She makes it quite clear on the nlcr mission statement asking for donations and volunteers. This was originally on the web site of East Baptist Church in Twin Falls, one the two churches supporting the mission to Haiti, but has subsequently been taken down. Notice that Silsby had plans to build an orphanage, school and church in the Dominican Republic before the earthquake in Haiti. She decided to take advantage of the opportunity that presented itself and “go now”. She did this because “God laid upon our hearts the need” to go now. 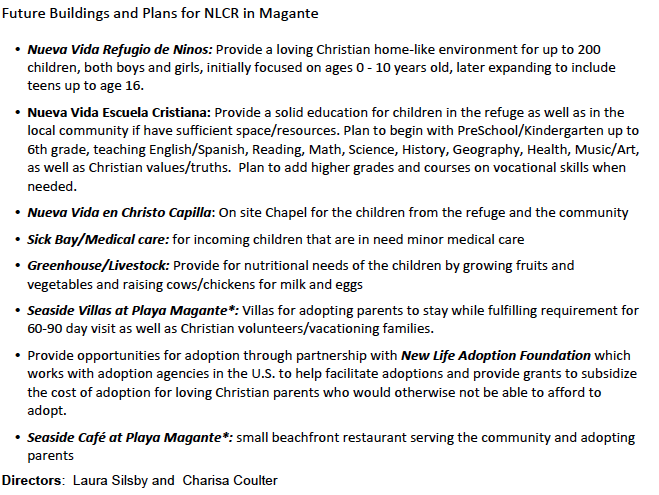 Silsby filed to incorporate New Child Refuge in November (see document here New Life Children’s Refuge Incorporation ) It has tax exempt status with three board members- two of them being Silsby and her nanny and appears to be located in her home. Here is the hubris. These people seem to believe that God speaks to them. They believe that God wants them to take children, most of whom are already Christian (given that Haiti is a largely Catholic country) and help them “find a new life in Christ”. Their “charity” masks their real intent- to convert the children. As Rev. Clint Henry of the Central Valley Baptist Church points out, this is the central tenet of their religion. We believe that Christ has asked us to take the gospel of Jesus Christ to the whole world, and that includes children. The long range plans for NLCR were a bit more grandiose. It is all about teaching the “orphans” Christian values/truths so they can be adopted by loving Christian parents. This is only the latest chapter in the history of the corrosive combination of Christian missionary work and colonialism. If you are wondering why the Haitian people might be distrustful of outsiders claiming to “help” them, you might want to read this. So Statesman editorial board, I am sorry if I sound judgmental, but I find all of this disgusting. This story makes me sick. So “godly” people have been engaged in child trafficking in Haiti? That’s disgusting. Throw those criminals in jail. I see this as a story about poverty and about hubris. Bottom line, huh? As soon as I read that damned ‘plan’ on the website of Eastside Baptist (Twin Falls), I knew. I just knew. I’ve met many like Laura Silsby.